ATFA were very proud to play host to the first all-female table football tournament in Australia with 4 players registered to contest the inaugural title of Australia’s top female player. Imojjen Elmer, Beth Eveleigh and Æowyn Elmer fought out a tight group stage. A fiercely competitive spirit with equal amounts of fair play and sportsmanship were on display from the very first flick. Veteran Eveleigh played out a tense 0-0 draw with the up and coming Imojjen Elmer. Elmer displayed a deft touch and excellent defensive blocking; only lacking the killer instinct at the other end of the pitch. Eveleigh failed to break through and managed to find herself with 5 players offside (twice) whilst pressing for a goal. Elmer senior then fought out another goalless draw with Elmer junior who has the determination and tactical brain to challenge in the future. The final group match saw Eveleigh eventually break through the defensive wall and score two goals against Æowyn, taking her into the final against Imojjen. The final was watched by an increasingly absorbed crowd. Both players had their chances during the match but, once again a tense stalemate occurred which took Elmer and Eveleigh into 10 minutes of extra time. Then as the minutes ticked down Eveleigh found herself in the shooting area, but wide on the left flank with an acute angle on the ball. She took the shot which rocketed into the near top corner, somehow beating Elmer’s ‘keeper. ATFA President Batten noted during the following presentation that “Beth scored a golden goal worthy of winning any tournament”. future of the women’s game in excellent hands. 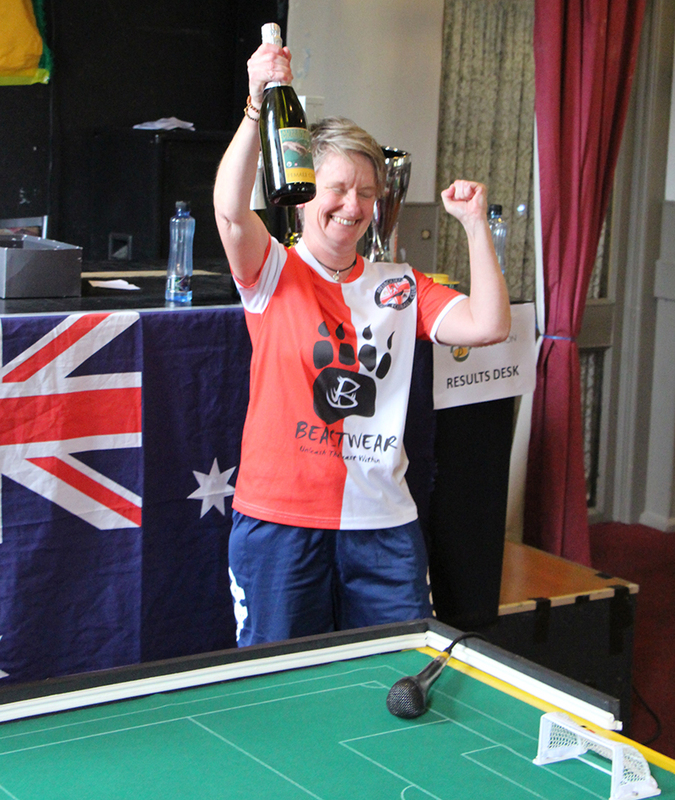 Beth Eveleigh (Melbourne Table Football Club) then accepted the inaugural Women’s Championship trophy with relief! 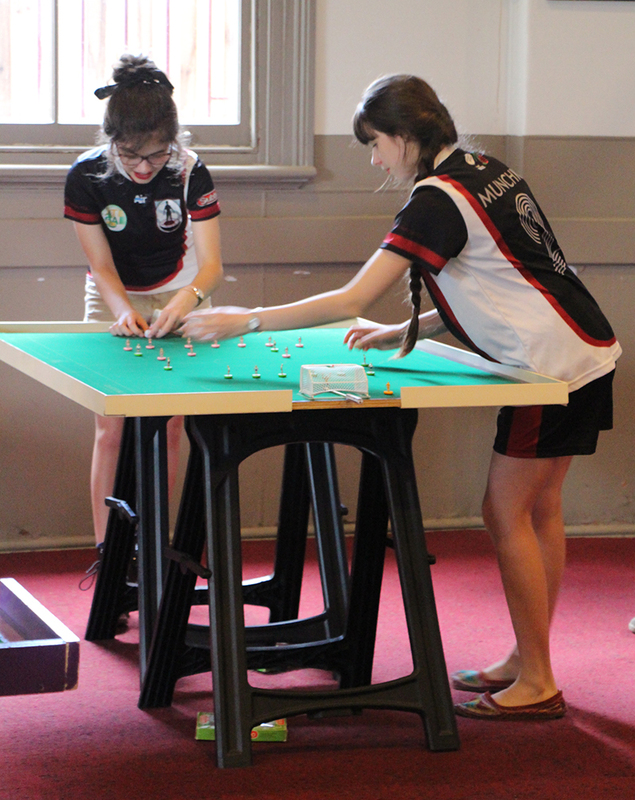 The players all left greatly enthused and determined to see future Womens’ tournaments grow. 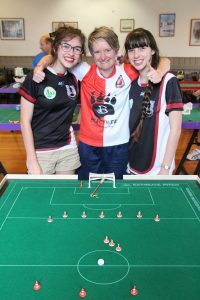 This entry was posted in News and tagged 2017 australian grand prix, fistf, womens' tournament on 23/02/2017 by ajebec.